I didn't think anyone actually read this, Little One, but a little birdie just asked me if I'm okay because I haven't written in a couple of days. I'm fine, and you're fine, as far as I know. I just have training this week, so while I'm thinking about you all the time (sometimes too much! ), I'm not writing to you much. Today had quite a bit of cramping, and my tummy's quite upset. I still think it's diet, but it's a little disconcerning, I won't lie. Today is 12 weeks!!! Can you believe that? In 6 days, that first trimester is o-v-e-r. Thank God for your healthy beginning so far. I'll keep hoping and praying that it stays that way for both of us. Today was also the first day I've worn a truly "maternity" piece of clothing to work. I wanted to wear my new capris from Target ($18 capris - under $4 on sale, thankyouverymuch! ), but they're still just a little too big. I'm wearing this super-duper comfy, stylish white maternity shirt over my way-too-tight jeans. :-) With my white socks and black shoes, I almost think I look cute! Note: I said almost. Ha! Today was a little harder. I had some cramping which worried me, but I think you just didn't like the junk food I ate all day! We re-scheduled our Dr. appointment, so we're actually going to see or hear you again on 9/9 instead of 9/12. Daddy is going to school for one more class so he can be a teacher, and he has class right when we were going to go to the doctor. So, we'll see you on 9/9 instead! Can't wait. 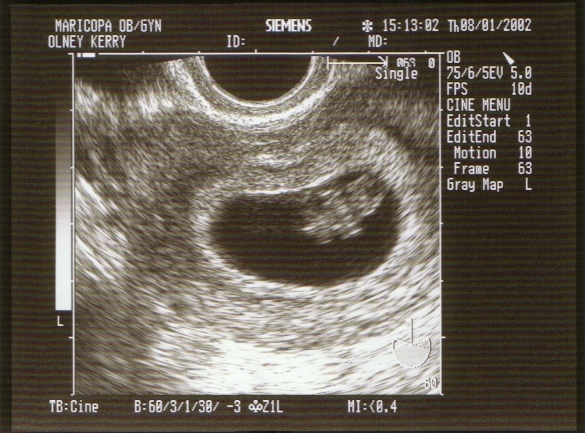 You're almost 12 weeks "old" in there, and we're about 9 days from the end of the first trimester. Guess things are rolling right along now, aren't they? I feel like we're making progress when one of the websites I visited stopped counting how much time is left in months, and started counting in weeks. Only about 26 weeks! When you think about that, it seems right around the corner, even though I know it's not. 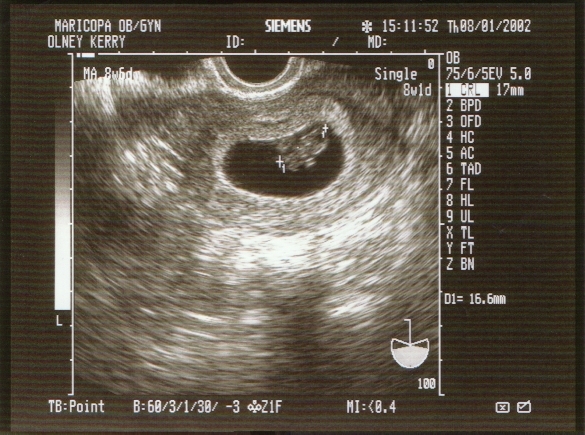 Well, baby, we're nearing the end of our 11th week, and we are officially 1/4 of the way there. This actually comforts me a lot. I'm happy to know that we're making progress. But I'm happier to know that I can be slightly more worry-free as we progress into 3/4 of this pregnancy. In a little over a week, our first trimester will be done, and we can relax just a little more. I have a little more energy now, but this weekend saw a lot more mood swings than I've been used to. That doesn't always make me the most pleasant person to be around, and I am trying really hard not to irritate the people around me!